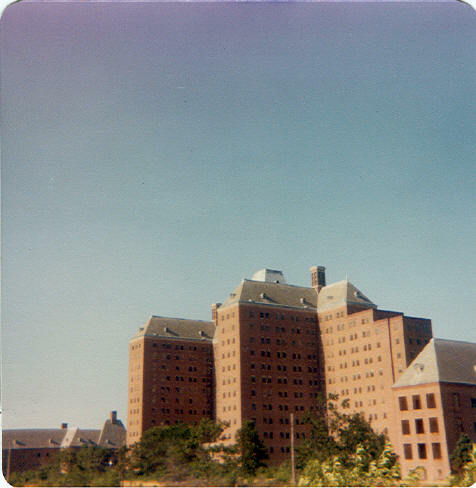 Edgewood hospital was originally built in 1940-1942 as a division of Pilgrim State Hospital. It was temporaily converted into part of a Miltary hospital known as "Mason General Hospital" which included buildings 81, 82 and 83 at Pilgrim.It also was supposedly used to hold German POW's in WWII, and reverted back to New York in 1945 at the war's end. The Mason Buildings at Pilgrim survive and are still in use. Edgewoood operated as a hospital that specialized in treatment of mentally ill patients that also had tuberculosis. It had a total of 10 buildings, with the mammoth main infirmary building #102 being the most notable landmark in Western Suffolk county. It had a gymnasium, chapel, backup power generators, railroad spur, central kitchen facilities, underground utility tunnels, a movie theatre, baseball fields, picnic benches, but no swimming pool. Water and power were supplied from Pilgrim's systems, and they shared most of the sewage treatment. They were one of the early places to utilize electroshock therapy, light therapy, and the revolutionary anti-psychotic drug Thorazine. There were padded rooms and heavily secured soundproof areas too. It also housed a drug and alcohol wing during the 1960's. 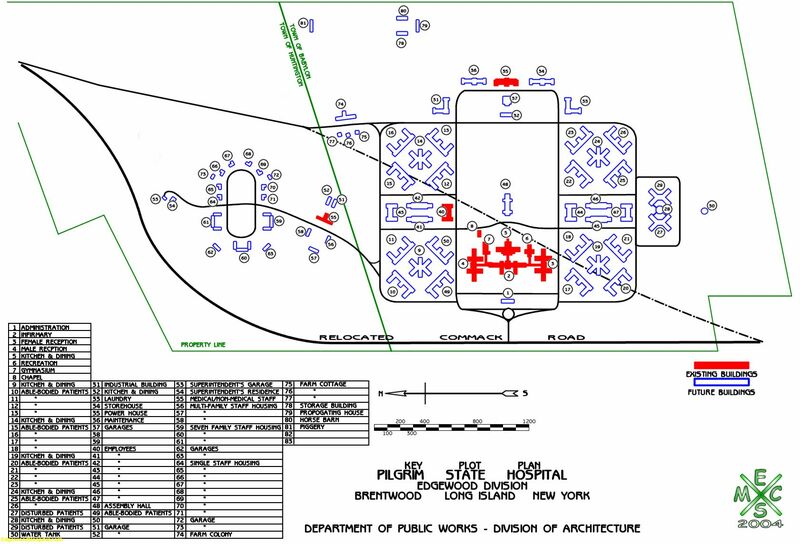 Other diligent researchers uncovered detailed plans that showed the complex at Edgewood was originally planned to have 83 structures, in fact it would have used almost the entire 850 acre tract! The main 13 story building 102 was to be at least 14 floors under that old plan, but only 13 floors were actually built. Other than the 10 buildings, the rest of the mammoth facility never got beyond the blueprint stages, allowing the bulk of the forest to remain undisturbed and mostly intact. Edgewood's heyday was in the 1950's, and began winding down already in the late 1960's as patients were released into the community. By 1971 it closed it's doors forever. Luckily they never built most of what they had proposed, which left a nice swath of oak brush plains intact and available for preservation. Heartland Industrial Park, just to the east across the Islip Town line, was never owned by the state, it was private land leftover from a failed 1920's era residential development and began commercial building around 1982. However, to the east of Heartland is another NY State parcel adjacent to the Sagtikos that needs protection. We jokingly used to call Edgewood the "accidental preserve" but a lot of effort was made to formalize it in law, or it would have been developed, most likely as single family homes or an industrial park. And without the constant efforts of Senator Johnson,it would almost certainly be gone today. In the 1960's, the patient population began to drop as antibiotics sucessfully eliminated the TB from many patients and Thorazine controlled the psychosis. In 1969 they began to phase it out, using only the diagnostic labs and X-ray equipment until 1971, when Governor Rockefeller ordered it to close it's doors forever. It sat around in fairly good condition, and in fact had just been painted and new air conditioning installed in the operating rooms a year or two before closing. Minor vandalism and theft took place through the late 1970's, but the real trouble began after a fire in 1977 in a residential building on the site made them decide to shut off all the power, plunging the site into darkness and eventual chaos. Vandals began to take their toll, as did nature, but by 1983 the buildings were still easily repairable. But no uses could officially ever be found for the structures, and by 1984 vandalism was getting real bad and arsonists began to burn the only wooden portions left, the roofs, and the fire department got tired of extinguishing them since NY state did not reimburse them for previous fires. In late 1984 the roof on the main infirmary 102 burned for more than week, and it left the building looking not so nice after it burned out. However, it was still structurally sound. 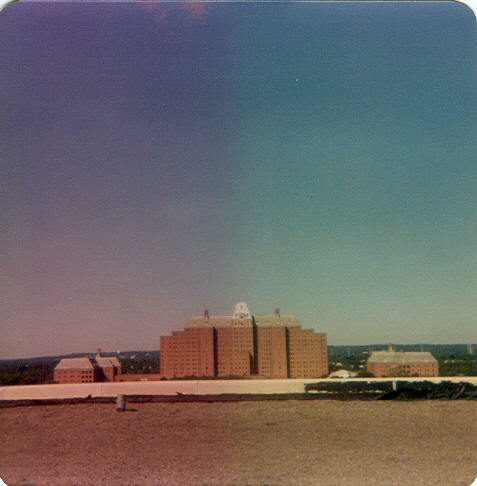 Building 102 was the tallest in Western Suffolk, about 229 feet high (above ground level) on the "crown" roof. You could see the Twin Towers and the Empire state building, and the spire of the Chrysler building from the "crown" area on a clear day, and see the north and south shores on an average day. You also could see the complex looming over the horizon from any of the south shore beaches, and from any high spot in the county. 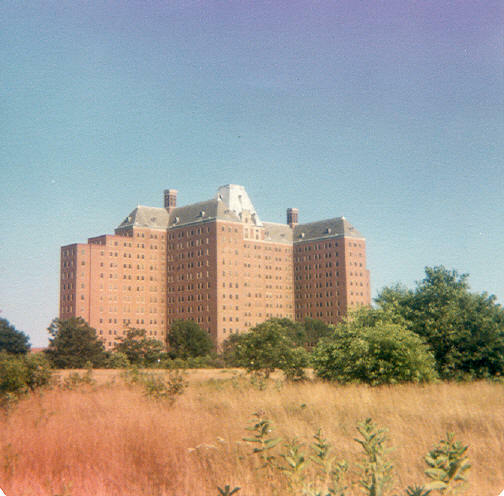 In 1986, after a quick look at alternative uses, the state began to plan for the demolition of the complex, but first had to remove all the asbestos and lead, as well as PCB filled transformers in the basements. The smaller buildings were taken down using a large backhoe with a demolition attachment, but the massive 13 story main building (#102) had to be imploded with dynamite. It was the largest demolition in Suffolk county history, and a huge dust cloud enveloped the neighborhood. Some windows in Deer Park homes were shattered, but quickly replaced. One section wobbled and almost seemed to stubbornly resist demolition, but finally toppled about 15 seconds after the rest. Then, the task of separating the recycleables from the junk began, and hauling away the waste. The Multi-town property was reacquired by the state and added to the preserve a several years later as were 86 acres of Pilgrim land in 1998, chiefly due to the continuing efforts of Senator Johnson. A few more acres (14 or so?) of public land may be managed as part of the preserve soon. The only remnants of Multi-Town are some abandoned monitoring wells, a weather station tower, and an abandoned trailer shack that used to house equipment for the tower. Thankfully, nothing else was built from that horrible idea. An early proposal was to bury all the building debris on-site, but many environmentalists, including myself, protested this bad idea and prevailed. That took about 3 months or so to complete. But the original 13 million was gone too, and the old steam plant, and buildings 103 and 140 were still standing. Someone had another idea to reuse the old steam plant as an incinerator (These ideas seem to NEVER die) but NY state thankfully ruled it out and funded the rest of the demolition. They also cleaned up the hundreds of stolen, abandoned and burned out cars that were dumped for years on the site. Most of the debris was trucked to a private landfill off Spagnoli road in Melville. The tall smokestack also was demolished using explosives, and the railroad trestle was torn down too. A section of track about a quarter mile long remains, overgrown with pitch pine. The rest was torn out during the demolition, and part of the railroad track base materials were used to fill in the old foundations. But the legislation that funded the $18+ million demolition also provided the creation of the preserve. Unfortunately, it did not fund the purchase of nearby wooded parcels such as Multi-town and Pilgrim west side lands, but luckily they were finally added to the preserve by 1998. Since these parcels were added later, they were not as clean, so we took on the task of hauling out tons of dumped junk, with help from the DEC who provided dumpsters and heavy equipment once we dragged out the stuff from the wooded areas. They also hauled out at least 20 more burned out cars. 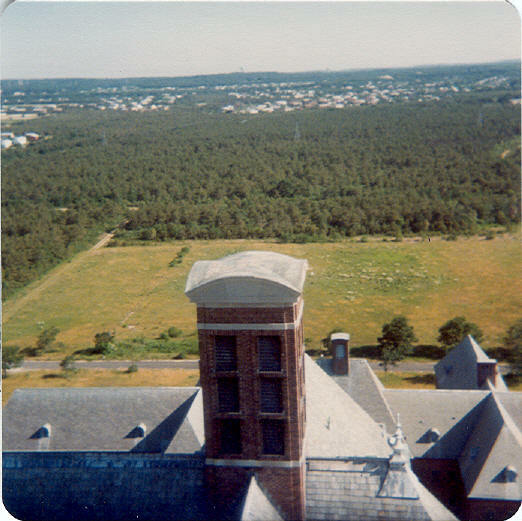 Some money that could have been saved in demolition costs could have bought some of the Islip undeveloped lands at the time as well, resulting in a larger preserve. But Islip was not interested in selling any of it's land to NY state for preservation. A proposed Pilgrim redevelopment could potentially bring thousands of jobs if it succeeds and bring about huge changes to our car-choked suburbs while providing an opportunity for life without the sacred automobile. It could even give young people a place to live instead of moving away. The existing industrial park does not allow any dirty process operations to move into the park, and tests so far have found no groundwater contamination. Two years after Edgewood was refused permission to tie into the county sewer district, the district later found room to allow Pilgrim to hook up. New capacity was now available due to a renovation of the Bergen Point plant. Heartland has received preliminary approval to hook into the sewer district, and the new Tanger Arches was also allowed to hook up in 2008. 102- 13 story main infirmary, 12 floors, with 13th floor operating room, 14, 15 and 16 floors were internal utility areas for elevator equipment, water tanks, etc. Major fire was around late 1984, the last building to lose it's roof due to arson. No real structural damage, but it looked awful, and people started complaining. 103- 4 story including basement to the direct south of 102, this was the female admissions building and also had the mortuary and laboratory on the basement level. Major roof fire and vandalism around 1983, but basic structure was still OK. Before demolition trees were starting to grow on the fourth floor! 104- 4 story including basement to the direct north of 102, and almost a mirror image of 103, this was the male admissions building and also held the arts and crafts classes and later became the drug rehab building. Had a massive fallout shelter. Badly damaged by 3 major fires, the worst one was the fallout shelter one that warped the floor above, then the roof fires that twisted many beams. Also the first demolished in 1989, other than 106. Still could have been renovated, according to the developers. 107- one level, this was the gymnasium, it had basketball courts, and looked just like your typical high school gym. It was built by the US ARMY while they occupied the complex in WWII. This also burned kind of early on, around 1978. 108- one level, this was the chapel. It was a small wooden building, and was not badly vandalized, however, it burned to the ground in 1980 or so probably due to arson. 135- multi partial levels and catwalks, this was the coal fired powerhouse. Designed to heat a much larger planned complex, it had no problem supplying all the steam and heat. It held a laundry, a small incinerator for medical waste, a chlorine treatment room for sewage that was in service until 1977, and backup generators which were rarely used. A rail spur originally brought in coal, the spur was already abandoned by 1965. The powerhouse was vandalized, and since it was designed pre-OSHA was a bit dangerous. It was largely intact, and not much in there (other than coal) could support a fire. Babylon town wanted to use it as a garbage incinerator so it almost got revived, but luckily the state said no to this BAD idea, which would have dragged countless diesel garbage trucks through the preserve. It was the last Edgewood building demolished, and sadly, someone trespassing late one night died after a fall in 1991. 140- 4 levels including partial basement, this was initially the the nurses staff housing, later became general staff and then was used for higher functioning patients who could have their own studio apartments. It too had it's roof burned off around 1983 or so. 155- 4 levels including partial basement and partial attic area bedrooms. This was medical staff housing, it was the last Edgewood building to close in 1977 after a nightime fire while it was still occupied. Did not use steam from the powerhouse but had it's own boiler. It was repairable but they chose to abandon it and it was demolished soon after in 1978 during the great blizzard of that year. There is one more rumor item that must be ended... NO Tunnels connecting Edgewood to Pilgrim ever existed, nor were there any ever leading to Building 155. 155 had its own boilers and any manholes there were for sewers and powerlines. Power did come in to Edgewood from the old Pilgrim Powerhouse, but via 2400 volt cable buried in conduits. It was also been stolen by scrap metal thieves long ago. All of Pilgrims tunnels are now divided between active and inactive. No one should even venture into active tunnels due to dangers of steam leaks. And the inactive ones are dangerous and a mess with asbestos everywhere. They do NOT connect to Suffolk Community College and never did, even when it was part of Pilgrim.